Here is a sermon I preached on the story of Mary of Bethany anointing Jesus’ feet before his final Passover. The Scripture text is John 12:1-8, which is the Gospel appointed for the Fifth Sunday of Lent in Year C, and in slightly longer form, for the Monday of Holy Week. The commentary by Karoline Lewis on WorkingPreacher.org definitely influenced my approach. 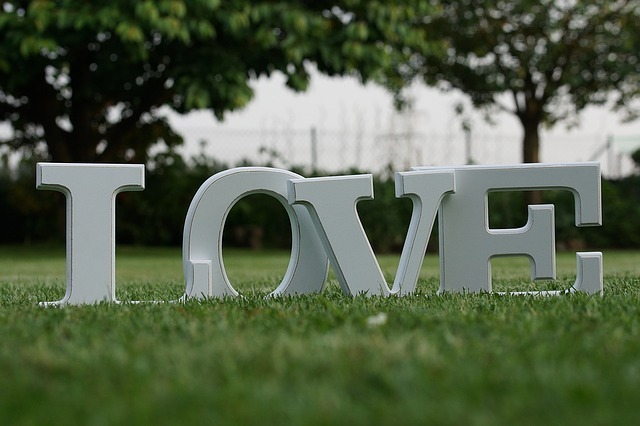 This entry was posted in Sermons and tagged Holy Week, John 12, Lent 5, Mary of Bethany, Year C on April 17, 2019 by gillianbarr. Just about every fountain pen blogger or vlogger will have published their own list. (Actually, I think there is fairly much consensus across the hobby as to which pens make the list—different people just put them in different order within their list, depending on whether they’re prioritizing price or aesthetics or durability or some other factor.) But a few friends have asked me for my list of good affordable places to start with fountain pens, so I decided to come up with my own list. Most of these pens have plastic bodies, which is the norm at this price point. Exceptions are the Jinhao x750, Pilot Metropolitan, the Platinum Plaisir, and the Italix Parson’s Essential. As to where to purchase: Goulet Pens is far and away my favorite site, because of their world-class, beyond-amazing, customer service. However, they do charge shipping and sales tax on every order, which, depending on the size of your order, sometimes makes a difference. (I don’t mind paying the extra because of all the time they spend on educating and expanding the fountain pen community.) But sometimes they don’t stock every color or nib width of every pen. Other options include Goldspot Pens, Pen Chalet, Jet Pens and Anderson Pens. Prices are pretty consistent across vendors—major differences are simply in shipping policies, as some will give free shipping after your order reaches a certain value ($25 for JetPens, $50 for Pen Chalet, $75 for Gold Spot). Pen Chalet also sponsors several podcasts, and listeners can receive a 10% discount if they have the podcast code. Jet Pens specializes in Japanese stationery, so if you like washi tape and cute Japanese decor, be careful there! Don’t forget you’ll also need ink cartridges, or bottled ink and a converter. Most pens will come with a starter cartridge or two, but may not come with a converter to enable you to use bottled ink, which is how you get to use all the fun ink colors. Converters run between $4-$8, depending on the pen brand. The individual pen listing’s specs will tell you what model converter you need. Bottled ink can be bought either in sample vials for $1.50-4.00, depending on the brand, or in full bottles, which range from $10-$40 but will last a very long time. One caution is to be sure you are buying fountain pen ink, not calligraphy ink or india ink. Some art ink brands advertise themselves as being usable in fountain pens but really aren’t. “Winsor and Newton” would be the primary offender in this–do not use their “calligraphy ink” in fountain pens even though they say it’s okay. The most popular ink brands for fountain pens include Waterman, Diamine, Pelikan 4001, Edelstein (made by Pelikan), Pilot, Iroshizuku (made by Pilot), Robert Oster, Sailor, and Noodlers. Waterman, Diamine, and Noodlers as well as the Pelikan 4001 and Pilot are probably the most affordable. You may also want some better quality paper. But that’s a more detailed discussion. Investing in a $12 Black & Red-brand notebook from Staples or $8 via Amazon , is a good way to start with fountain-pen friendly every-day paper. In order of ascending price, as any other way of ordering is totally subjective and dependent on way too many personal preferences. 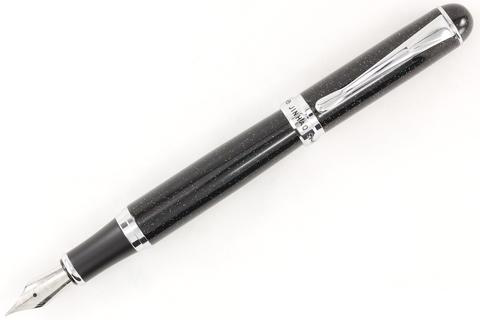 I link to the Goulet website for items where possible, because they have the largest community of reviewers and most detailed specs for each pen. If I’m aware of another vendor having markedly larger selection for an item, I note it. A photo gallery, in the same order as the list, is below. Platinum Preppy $5. Utilitarian plastic looks, but if you just want proportionally the best writing experience for the least money and don’t care about the looks or long-term durability, it stands alone. You can get a dressier version, with the same basic mechanism but with an aluminum body, under the name of the Platinum Plaisir for $18. JetPens may have a wider selection of nib widths than Goulet. Pilot Kaküno $14. Theoretically a pen for the younger set, hence the design, but very popular with adults too. Cute smiley face on the nib, which is otherwise identical to the nibs on the other entry-level Pilot pens. Check JetPens for more variety in nib widths. Pilot Kaküno. Image by Goulet Pens. Kaweco Perkeo. $17. 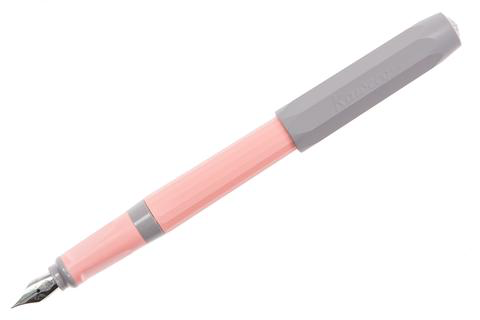 A new offering from Kaweco, so I don’t own one. But I love my other Kawecos. The Perkeo is a more traditional design than the Sport, and also takes standard size converters and ink cartridges. However, it has a triangular grip section, which can be useful in guiding your hand, but people with unusual grip styles can find them uncomfortable. There is no clip on this pen, so it can’t be attached to a pocket. 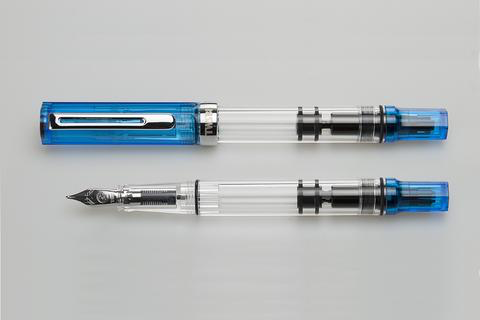 TWSBI GO $19. Tied with the Kaweco Sport for oddest-looking pen of the bunch, at least in my view. And another newcomer which I don’t own. 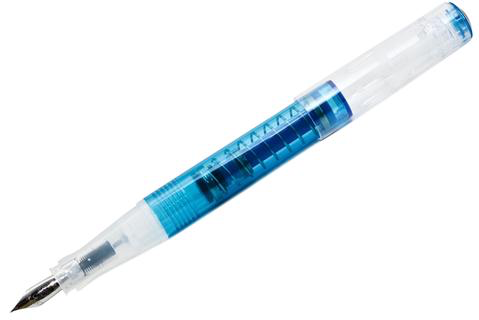 This pen (along with all its TWSBI siblings) is a piston-filler, which means you can’t use ink cartridges, but need to fill it from a sample vial or ink bottle. This pen’s spring-loaded piston is supposedly even easier to use than a conventional piston. TWSBI GO. Image from Goulet Pens. Jinhao x750 ($9) and a Goulet nib ($15), for $24 total. Jinhao pen bodies, made in China, are fine, but their nibs can be hit or miss. But the neat thing about the x750 in particular is you can swap the nib easily—it’s a “#6,” which is a standard size. So just buy a Goulet (or Anderson) nib and swap it in. Also, Amazon has more varied selection of Jinhao x750 colors and materials than Goulet does. Note that other models of Jinhaos do not necessarily have replaceable nibs—it’s just the x750 that I’d recommend. Pilot Metropolitan. 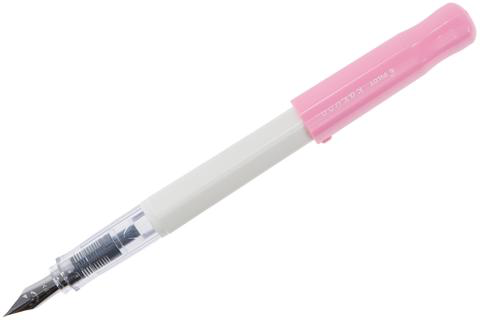 $24 or for $20 at JetPens. One of the most frequently recommended starter pens, and with good reason. Pilot Explorer. $24 Newcomer to the Pilot line, so one of the few pens on this list I do not personally own. Same nib as the Metropolitan, but a plastic body rather than metal, and flat-top design rather than cigar/torpedo shaped. Gets good reviews and I’ve never experienced a bad Pilot fountain pen, so I recommend it sight unseen without hesitation. Pilot Explorer. Image from Goulet Pens. Kaweco Classic Sport $25. 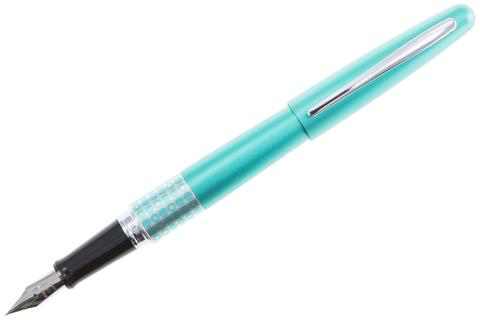 A pocket pen whose petite and idiosyncratic design you will either love or hate. The faceted design dates back to the company’s earliest pens in the 1930s. Very short when capped, when uncapped with the cap posted on the back of the pen they are a normal length. Regular grip section, rather than the triangular one of the Perkeo. Doesn’t have a clip. Kaweco Classic Sport. Image from Goulet Pens. LAMY Safari $30. Probably tied with the Pilot Metropolitan for most-recommended starter pen. Annual special editions dangerous to the wallet of anyone who has to “catch them all.” I’m not a fan of LAMY’s Bauhaus aesthetic personally, but they are workhorse pens. Also have a triangular grip section, which is a plus or minus depending on your personal preferences. Pelikan Stola III. Image from Pen Chalet. Italix Parson’s Essential. £38, which as of the date of this writing, pre-Brexit, is approx $50, plus $15 international shipping. Only available direct from manufacturer, “Mr. Pen UK.” Quite a bit of a jump up in price here, but I had to include it for the name alone! Also, while the Italix pen bodies are sourced from China, Italix focuses on the nibs of the pen. If you want an “italic” or wider, flat, calligraphy-style nib, theirs are very smooth. They have an incredible selection of different nib widths and types, which is very rare nowadays and almost unheard of in the entry-level market. I don’t have any of their non-italic pens, but I would expect them to also be smoother than some others. This entry was posted in Resources, Stationery on March 18, 2019 by gillianbarr. I’m putting this up right now without comment just so I don’t lose track of it. But when I have time I’d like to reflect on what Brian and Kara are saying about the stationery world and their professional trajectories and compare and contrast it with the post-Christendom church. Live Goulet Q&A with Boho Berry . This entry was posted in Stationery and tagged Brian Goulet, online community, social media, Stationery on December 26, 2018 by gillianbarr. This entry was posted in Sermons and tagged 2018, Christ the King, Good Shepherd Pawtucket, Truth, Year B on November 25, 2018 by gillianbarr.